I don’t know what it’s like in your neck of the woods, but it still feels like summer here. The autumn equinox came & went & we’d never know it. It’s been in the high 80s-90s this week, & next week is expected to be even hotter! Why? Why? Why? I have to remind myself that this is actually pretty typical for San Diego, September & early October tend to be the hottest time of year. I know I really shouldn’t complain, we have it pretty good around here most of the time. Even my CSA box is still reminiscent of summer – filled with tomatoes, summer squash & peppers. A few days ago I made use of the squash, tomatoes, & some sweet peppers in my “Late Summer Pasta Sauce,” but I still had a huge bag of poblano peppers that needed some love. A few weekends ago I a made a wonderful Mexican style tofu scramble with poblanos, tomoates, & roasted corn & cheddar Daiya that I promise I will share soon. I had half a mind to make another batch, but was craving something different. So I settled my other standby – stuffed peppers. I took inspiration from my tofu dish & combined roasted corn & tomatoes with quinoa, black beans & spices – the perfect filling for Mexican style stuffed poblanos. Set oven to broil. Place the peppers skin side down on a foil lined baking sheet & broil 5 minutes, to start the softening. Remove from heat. Turn oven down to 400. Heat 1 tsp. olive oil in a large saute pan. Add diced onion, & cook until soft about 5 minutes. Add the cooked quinoa, black beans, tomato, corn, cumin, chipotle chili powder, & a pinch of salt & pepper. Stir to combine & cook until heated through. These smoky stuffed peppers make a nice light meal on a warm evening, especially washed down with a cold cerveza with lots of lime. 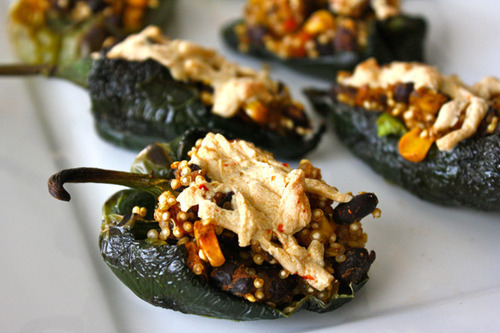 These would make a wonderful little appetizer served along side a entree sized chopped Mexican salad.